of potential investors, called "sharks", that consider offers from aspiring entrepreneurs seeking investments for their business or product. The entrepreneur can make a deal on the show if a panel member is interested. However, if all of the panel members opt out, the entrepreneur leaves empty handed. The "sharks" often find weaknesses and faults in an entrepreneur's concept, product, or business model. “The Pitch”: Students will be carrying out a very close version of the Shark Tank program in class using new inventions from the early 1800s. Each student will be invited to make a pitch as a representative of an early 1800s Market Revolution entrepreneur. Entrepreneur representatives will pitch their invention using a presentation they create, and “sharks” can ask questions to better help them make the best investment decision. “The Sharks”: During the other presentations, you and your group will act as a “Shark”. 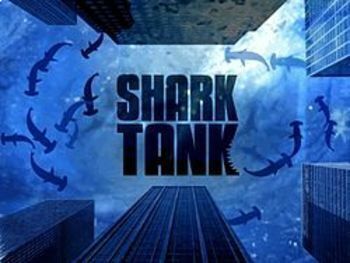 Each Shark Tank member will rank in order where they would invest their money, and they will decide the rankings based on the entrepreneur representatives’ presentations. Shark Tank members will be allowed to decide to invest their money in any, none, or all of them. This can easily be adapted to any other time period you like!